On the heels of China’s approval of tougher sanctions on North Korea—following Pyongyang’s fourth nuclear test—there was, for a moment, a sense that China’s policy on Korea was changing. Many speculated that Beijing had finally abandoned Pyongyang in favor of warming diplomatic and economic relations with Seoul, which would undermine a strengthened US-Japan-ROK alliance. This interpretation, despite gradually losing credibility, shed light on China’s Korea predicament: its strategic objectives—regional peace and stability (under Chinese leadership) and denuclearization of the Korean peninsula—were becoming increasingly at odds with each other. Beijing would have to choke Pyongyang politically and financially to prevent it from fully nuclearizing and setting off an arms race in a region already mired in historic animosities and territorial rows. At the same time, too effective an intervention would trigger the collapse of the Kim regime, subsequent turmoil of which would be squarely borne by China. A sudden political vacuum in Pyongyang could even embolden Washington to unify Korea under US-allied Seoul’s leadership, depriving Beijing of its most valued strategic buffer. Beijing prioritized a status quo in the past—keeping Pyongyang’s lifeline intact—but neglecting North Korea’s nuclear ambitions is proving more costly with each additional nuclear test. Notably, the absence of Beijing’s intervention has prompted Seoul’s renewed embrace of Washington, which is manifested in their joint decision to deploy Terminal High Altitude Area Defense (THAAD). The THAAD development has been the single clearest sign to Beijing that its failure to rein in Pyongyang’s nuclear pursuits can hurt its core strategic interests, although military experts insist that there is no such impact on its deterrence capacity. In this commentary, I use THAAD as a case study to understand how China has sought to influence Seoul’s behavior and who in Seoul have been influenced by China’s strategy. I also explore how next year’s election may affect Seoul’s attitude toward China. Relying primarily on South Korean sources, I report on prominent voices within Seoul on China’s Korea policy, highlighting the differences among the three major parties as well as their internal divisions regarding THAAD specifically, and China more generally. 1 THAAD, therefore, symbolizes Seoul’s reaffirmation of Washington as its primary security provider, marking a fundamental divergence in Beijing and Seoul’s perception about and approach to the North Korean nuclear threat. China’s opposition to THAAD stems from its belief that its primary objective is to track missiles launched from China, rather than defend against North Korea’s nuclear weapons. China’s foreign minister Wang Yi stated, “The THAAD system has far exceeded the need for defense in the Korean Peninsula and will undermine the security interests of China and Russia, shatter the regional strategic balance and trigger an arms race.”4 Indeed, given THAAD, China will continue to develop newer, more powerful missile capabilities as a countermeasure.5 And at the same time, it will try to reverse, or at least suspend, Seoul’s decision by political, economic, and geostrategic blackmail. China’s strategy to overturn the THAAD decision will likely involve the following three dimensions: 1) a political one in which China uses North Korea as a bargaining chip, 2) an economic one in which China leverages its commercial influence in South Korea, and 3) a diplomatic one in which China negotiates with the United States, bypassing South Korea altogether. At the time of writing, Korean sources suggest that the Chinese retaliatory measures remain mostly rhetorical, though they could turn more punitive, given South Korea’s vulnerabilities. Politically, China has leveraged its influence in North Korea by unilaterally frustrating the implementation of Resolution 2270. It is common knowledge that China’s full and transparent participation will determine the effectiveness of the sanctions under 2270. China, however, continues to be lenient towards North Korea, failing to punish Chinese middlemen who facilitate Pyongyang’s WMD procurement processes and abusing the “livelihood exemption” to keep North Korea afloat. As demonstrated by Pyongyang’s fifth nuclear test in early September, just 8 months after the January test, North Korea is continuing to proliferate—in fact, at an accelerated pace. Seoul, of course, blames Beijing for it. China has also hampered a united, timely international response against North Korea by using its UN Security Council veto power. China rejected the adoption of the Security Council’s statement on August 3 condemning North Korea’s firing of two ballistic missiles that reached Japan’s Exclusive Economic Zone.6 China insisted that the statement include an opposition to THAAD, which it believes is partly responsible for Pyongyang’s missile provocations. While China begrudgingly accepted the Security Council’s statement on August 26 after North Korea fired submarine-launched ballistic missiles (SLBMs), this decision is seen by many in Seoul as Beijing’s attempt to avoid confrontation prior to the G20 Summit.7 It remains to be seen whether China will cooperate as the Security Council moves to approve a fresh set of sanctions on North Korea. Experts remain more concerned about possible economic retaliation.8 China (including Hong Kong) accounts for nearly a third of South Korea’s exports. Almost half of total foreign visitors to South Korea are Chinese, who spend, on average, five times more than an ordinary foreign tourist. Moreover, Chinese investors hold 17.5 trillion won in South Korea’s government bonds and publicly traded securities. In sum, China constitutes South Korea’s number one trading and investment partner by a wide margin, and could deliver a detrimental blow to the South Korean economy at will. Noting these concerns, Kim Heung-gyu and Choi Ji-yeong list five ways in which China could economically retaliate11: 1) placing greater non-tariff barriers to trade such as customs and inspection requirements; 2) banning Chinese tourism to South Korea and slowing visa issuance; 3) using state-controlled media to organize boycotts and smear campaign against South Korean companies; 4) targeting South Korean companies operating in China, and 5) dumping Chinese capital investment in South Korean financial markets. Of these, they suspect the first two measures are the likeliest, albeit limited in scope. Despite these prevalent concerns, there is no major sign of Chinese economic retaliation—yet.12 According to the Korea International Trade Association, China has already adopted 26 measures that affect its members, including licensing restrictions on cosmetics and stricter hygiene inspection requirements on food items. But as others have noted, while South Korean exports to China declined by 9 percent in July, the figures are relatively modest when taking into account the broader context of sluggish economic growth. Allegations about China’s targeting of the South Korean entertainment industry remain unsubstantiated, and a sharp decline in share prices of South Korean companies in tourism, electronics, and cosmetics appears to reflect market uncertainty based on expectations of retaliation, not retaliation itself.13 Indeed, no source has been able to verify a direct link to Chinese intervention. Most analysts deem large-scale retaliation by Beijing unlikely, as sanctions may violate the terms of their bilateral free trade deal concluded last year and disrupt China’s efforts to win market economy status from the World Trade Organization (WTO).14 Further, a weakening of economic ties with South Korea is undesirable for China, particularly as it struggles to engineer an economic recovery through expansionist policies. Though the degree of economic reliance between China and South Korea is asymmetric, China risks considerable pain in pursuing economic retaliation against Seoul. In this scenario, Beijing does not even attempt to change Seoul’s behavior. Instead, it negotiates the degree to which it will cooperate on North Korea for Washington’s alterations to the THAAD arrangement with Seoul. Eric Heginbotham and Richard Samuels argue that “if China were to agree to serious graduated sanctions on North Korea, the United States could agree to freeze the number of ground-based missile interceptors on the Korean Peninsula.” In addition, Washington “might also agree, after consulting South Korea, to withdraw THAAD from the peninsula when North Korean nuclear weapons no longer pose a threat. "16 This type of diplomatic retaliation would signify China’s belittlement of South Korea as a satellite state of the United States, and may hurt the reputation and legitimacy of Seoul as a principal actor in the North Korean conundrum. The THAAD issue has severely deepened the party fault lines on how Seoul should handle North Korea’s nuclear threat vis-à-vis Washington and China. Prominent figures within the three major political parties in South Korea have voiced opinions ranging from abandoning THAAD and engaging with North Korea through China to developing indigenous nuclear capabilities in South Korea, in defiance of Washington. THAAD demonstrates the divisiveness in Seoul about the right way to deal with North Korea vis-à-vis Washington and Beijing. Indeed, Seoul’s decision is largely framed as a binary choice: deploying THAAD and consolidating security alliance with Washington or foregoing THAAD and incentivizing Beijing to take more proactive measures against Pyongyang. This binary approach is evident in Korean public discourse, which labels those who support THAAD as “pro-American,” and those who oppose it as “pro-Chinese.”27 Seoul’s current policy favors Washington, though multiple variables could upend the present state of affairs, most importantly China’s Korea policy and South Korea’s upcoming presidential election. Seoul’s approach to THAAD—and China more broadly—could also change depending on the outcomes of the upcoming presidential election in December 2017 (which coincides with the deadline for THAAD deployment). Among the prominent candidates, Moon Jae-in of the TDP has maintained an ambiguous stance on THAAD, while Ahn of the PP has firmly established his opposition. Analysts note that Moon is particularly careful about voicing his opinion on THAAD and preference for the Sunshine Policy, as he suffered being labelled “jong-buk”—“follower of the North”—in the last presidential election, which he lost to Park by a slim margin.31 While THAAD itself may not be an important issue in the next presidential election, the candidates’ approach to the North Korean problem will be critical. Given South Korea’s strong executive system, the newly-elected president could completely reshape Seoul’s North Korea policy—including THAAD—and what role Beijing will play. 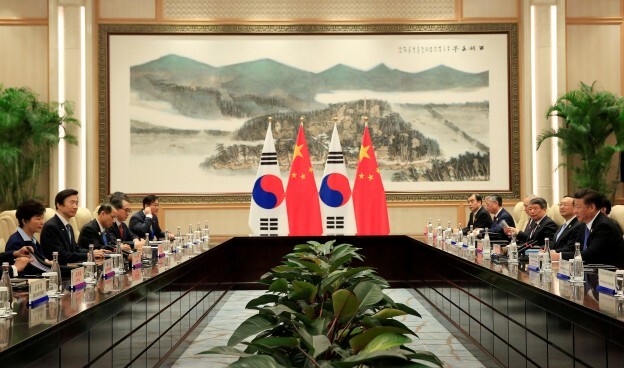 Whether Seoul will maintain its “no” to China depends on a number of factors. How far Beijing decides to cooperate with Seoul on North Korea and who becomes South Korea’s next president will play a significant part. Other variables such as Pyongyang’s additional provocations—a possible sixth nuclear test—and China-US dynamics in the South China Sea cannot be ignored, either. The deepening division within Seoul about how to deal with North Korea and the growing instability in the region make Seoul’s trajectory all the more volatile. 1. “시진핑에 실망한 대통령 “中역활 기대말라,” 조선일보, 2016년 2월 13일. 2. “중국 전략목표는 한국의 핀란드화,” 신동아, 2016년 9월 13일. 3. 양정대, “中 환구시보 “한국 기업 제재하고, 왕래도 끊어야,” 한국일보, 2016년 7월 8일. 4. Jane Perlez, “For China, a Missile Defense System in South Korea Spells a Failed Courtship,” The New York Times, July 8, 2016. 5. David E. Sanger and William J. Broad, “China Making Some Missiles More Powerful,” The New York Times, May 16, 2015. 6. “유엔 안보리, 北 SLBM발사에 긴급회의…규탄성명 채택 수순(종합),” 연합뉴스, 2016년 8월 25일. 7. “China accepts UN Security Council press statement on North Korea,” The Hankyoreh, August 29, 2016. 8. “After THAAD deployment decision, a backlash from China,” The Hankyoreh, July 11, 2016. 9. Jiyeon Lee, “South Korea Fears China Trade Hit Over Missile System” Bloomberg, August 4, 2016. 10. Alastair Gale and Kwanwoo Jun, “South Korea Braces for China Economic Punch in Radar Fight,” The Wall Street Journal, July 11, 2016. 11. “한국경제 숨통 쥔 중국의 5가지 경제보복 수단,” 한겨례, 2016년 7월 10일. 12. “Little sign of economic retaliation from China,” The Korea Herald, July 18, 2016. 13. 서화동, “韓流 vs 寒流, 결국 콘텐츠다,” 한국경제, 2016년 8월 21일. 16. “U.S. says THAAD not negotiable, but confident on North Korea sanctions,” Reuters, September 23, 2016. 17. 서상현, “새누리, ‘자위적 핵무장론’ 재부상… 여야 ‘북핵 규탄 결의’ 공조,” 한국일보, 2016년 9월 10일. 18. “미국도 반대하는 ‘핵무장’ 한다고? “북핵 대응 실패 덮기용,”” 한겨례, 2016년 9월 12일. 19. “새누리, "사드배치 찬성" 공식 당론 채택…강력 의지 표명,” 뉴스한국, 2016년 8월 30일. 20. “‘사드 배치’ 더민주 “졸속 결정은 유감, 반대는 안해”…당내에선 “반대” 파열음,” KBS, 2016년 7월 8일. 21. “더민주 의원들 성주 이어 중국 방문,” 한겨례, 2016년 8월 4일. 22. “추미애, “고삐풀린 북핵, 햇볕정책 버린 강풍정책의 결과,’ 한겨례, 2016년 9월 11일. 23. “안철수 "사드, 국회비준 필요…국민투표도 검토해야",” 연합뉴스, 2016년 7월 10일. 24. “안철수 “사드, 대북 제재에 중국 협상 카드로 써야”,” 한겨례, 2016년 9월 19일. 25. “국민의당, 靑·中 싸잡아 비판하면서도 더민주와는 차별화(종합),” 연합뉴스, 2016년 8월 8일. 27. “내년 12월을 결정짓는 사드 배치와 대선,” 경향신문, 2016년 7월 16일. 28. “<北 핵실험> 분수령 한중관계, 전화위복 계기 맞나,” 연합뉴스, 2016년 9월 10일. 29. 조호진, “북한의 5차 핵실험에 반발한 중국 "새로운 엄격한 대북 제재 채택해야",” 조선닷컴, 2016년 9월 14일. 30. “<北 핵실험> 中에 통보했나…’회복궤도’ 북중관계 어디로 갈까,” 연합뉴스, 2016년 9월 9일.